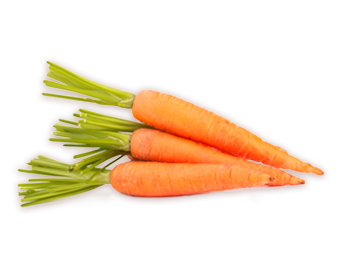 Carrots (Daucas carota) are well-known for their high content of beta-carotene and Vitamin A. They also contain other important nutrients like thiamin, niacin, Vitamin B6, Folate and Manganese and are a very good source of dietary fiber, Vitamin C, Vitamin K and potassium. Research shows that powerful antioxidants like beta-carotene may promote cardiovascular health and healthy vision. After beta-carotene is converted to Vitamin A in the liver, it travels to the retina where it is transformed into rhodopsin, a purple pigment that is necessary for night-vision. Studies have also shown that the intake of carotenoids may be helpful in glucose metabolism in some individuals.